While Nuuk hosts a distinctly urban feel (despite its small size), nature is never far. The iconic mountains of Quassussuaq/Lille Malene and Ukusisaat/Store Malene can be tackled on a hike just outside of downtown. It's not long after departing Nuuk Harbour that the fjord transitions to a true wilderness of snow-capped mountains and barren islands. When you arrive in Nuuk you might be a bit overwhelmed about where everything is and how you get there and the lack of internet does not make it easier. But fear not, with the Colourful Nuuk app you have an always updated city map and weather chart on your phone! Also you can find loads of other information like the digital Art Walk that will give you a guided tour around the city to see all the public jewels of art. The app also contains contact information on businesses, emergency numbers, events, travel stories and much more. As cool as we think Nuuk is, we also know that you might want to combine the city with other destinations in Greenland. If this interests you, you can find lots of inspiration at the official Visit Greenland website. Here you can also find lots of advice on travelling to Greenland like - what to pack, weather, tips & tricks. Maybe you wonder, what is Nuuk actually like? What are the people like? What does it look like? What can you do here? What does "Colourful" even refer to? Well, stop wondering and watch the video by The Copenhagen Traveler. It will take you on a small journey displaying how Nuuk is a city of contrasts - a city where traditions meet the modern, nature meets urban and legends intertwine with everyday life. Nuuk- a welcoming, colorful and pioneering city! A place to be discovered! Epic nature, epic colours, epic Nuuk, epic Monday. Thank you @malikbrons for this gem! #colourfulnuuk #beapioneer #visitgreenland #epicmonday ・・・ Golden hours. Nuuk is the capital of Greenland and with more than 17,500 inhabitants it is by far the largest city in the country. You can explore the colourful culture that mixes the traditional and modern. Learn about the history in one of the museums or go shopping in the only shopping centre in Greenland. You can also take on one of the hiking trips just on the edge of the city and enjoy the view of the skyline from above on top of the mountains. The abandoned settlement Kangeq lies at the mouth of Nuup Kangerlua. The settlement was the first place the founder of Nuuk – Hans Egede – settled down, and it was inhabited until the 1960’s. Kangeq is also the birthplace of the famous Greenlandic artist Aaron (1822 - 1869), who painted stories from traditional myths and legends. You can visit the abandoned settlement of Qoornoq that is now a place where locals stay for their vacation. It lies ideally in the fjord, and during your visit in the beautiful settlement you have a chance to visit the charming Qoornoq church. After an hour of sailing you arrive at Qooqqut – a collection of huts and cabins with a playground, a streaming river and a restaurant. Situated in an isolated location, Qooqqut is surrounded by an awe-inspiring natural landscape as far as the eye can see. Experience an amazing cruise deep into the fjord of Nuuk. The boat will go as far as the ice conditions allow; providing views of the amazing ice floes, wildlife, and the turquoise sea. 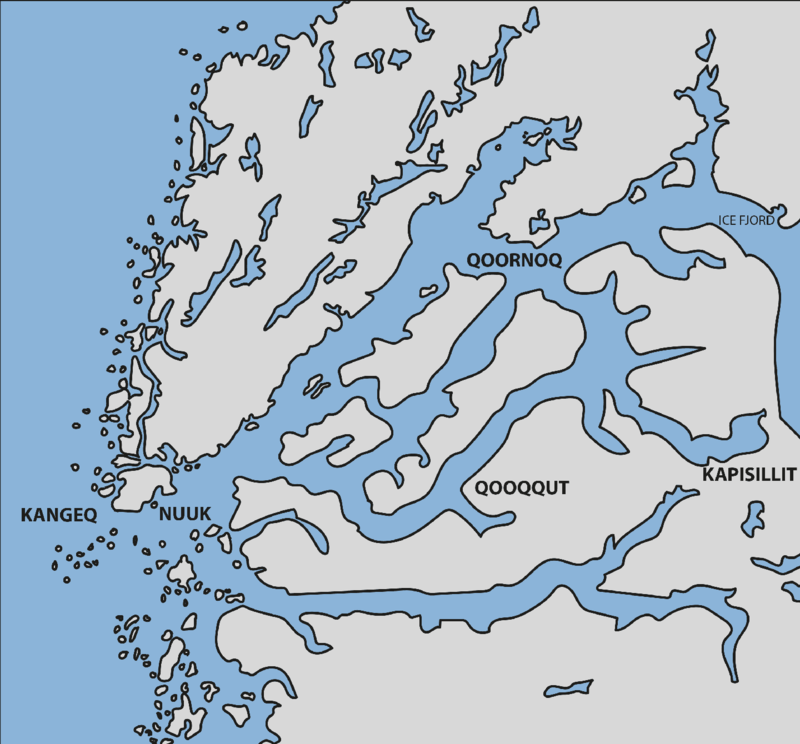 Depending on the weather, the boat arrives at the mouth of Kangersuneq after approximately 2 hours of sailing. From here there will be a perfect view of the Narsap Sermia glacier. Near the ice fjord is small settlement with around 80 inhabitants. There is a small hostel, a good chance to explore the nature by hunting, fishing and hikes to the ice fjord. On your way there you might be so lucky to see jumping salmon. It is an unusual sight in Greenland but not in Kapisillit – because the river here is the only one in entire Greenland that has a natural, breading tribe of salmon.